Students from University of Nevada, Las Vegas traveled to Denver to compete in the U.S. Department of Energy’s Solar Decathlon 2017, where UNLV Team Las Vegas achieved a first-place ranking in the innovation part of the 10-event decathlon, awarded 98 points out of 100 points for that category. 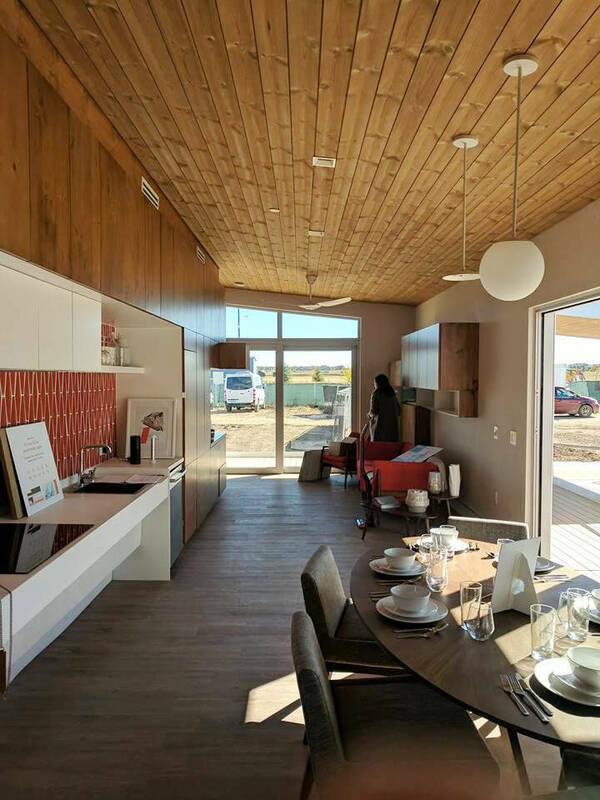 UNLV Team Las Vegas designed and built “Sinatra Living,” an energy-efficient, solar-powered home that could actively support aging residents. Cross-disciplinary challenges involved students from the UNLV colleges of engineering, architecture, hotel management, health sciences, fine arts, business and construction management. All 10 decathlon events tested each student’s design and construction capabilities in the categories of architecture, engineering, communications, affordability, market appeal, comfort, hot-water usage, appliance efficiency, energy balance and innovation. Six of the events were juried while four of the events were measured, in order to calculate a points total from zero to 100 for each of the 10 competitions, resulting in a maximum possible total of 1000 points. The Sinatra Living home was awarded second place in both the architecture and engineering competitions, sixth in market potential, fifth in communications, and ninth in water usage. Non-juried, measured contests included health and comfort, appliances, home life and energy balance. In overall competition, UNLV Team Las Vegas was ranked eighth place out of 11 collegiate competitors, amassing a total score of 748 out of a possible 1,000 points. Taking first place for innovation was notable, as the competing international field included student teams from UC Berkeley and UC Davis in California, Washington University in St. Louis, Northwestern University, University of Maryland and Ecole Polytechnique from Lausanne, Switzerland. The Swiss team was the overall winner of the Solar Decathlon events with a top score of 873 points. Nasko Balaktchiev and Adam Betemedhin led a team of 18 UNLV students with ambitious goals to integrate their decathlon challenges into a unified solution for an aging U.S. population. Associate Professor David James, director of Solar and Renewable Energy Programs at UNLV, was inspired by the book “Alone And Invisible No More,” written by physician Allan S. Teel. U.S. health care studies estimate that in just three years, 45 percent of all U.S. households will contain at least one person 55 years or older, as average life expectancy continues to extend beyond age 80 for many Americans. Over 20 percent of the U.S. population is estimated to exceed age 65 by 2050, with about three-quarters of that population expected to require some form of long-term health care. As many as two out of five elderly retirees may also need nursing home assistance, at the same time as the number of younger caregivers available for this aging population continues to diminish. 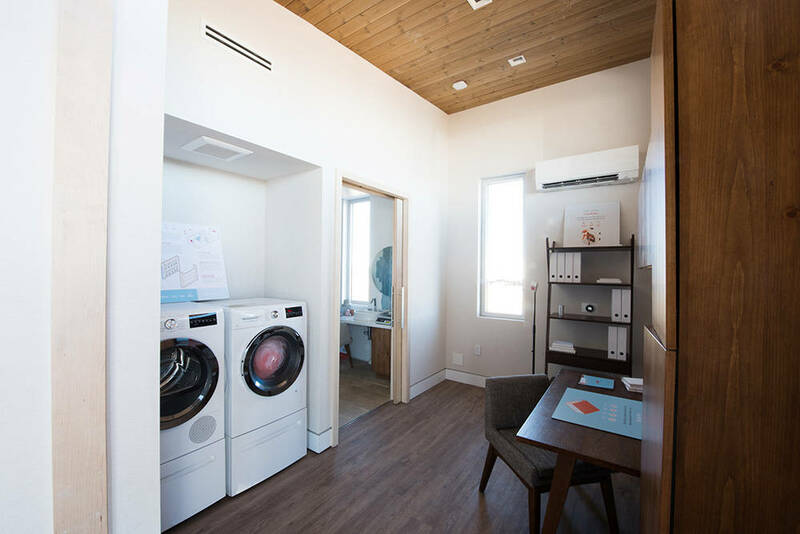 UNLV Team Las Vegas designed a compact, 990-square-foot home that focused on achieving three primary goals for elderly residents. The first goal was to provide an open, naturally illuminated interior design that could adapt to the needs of people who age in place. The layout of the home encouraged residents to circulate between rooms and exercise by walking around, but the open floor plan also allowed visibility through each of the rooms to provide ease of recognition and orientation. Storage, appliance and countertop spaces were made adjustable for wheelchair access, but also blended in with the walls to allow for more open areas within each room. An office workspace desk could convert into a fold-down bed for a family caregiver or health care professional. The second goal of the project was to provide maximum comfort through a net-zero energy performance design that included radiant heating, energy recovery, ventilation and ductless air conditioning. The room temperature and lighting were intuitively controllable from a single console by tapping a touchscreen or by speaking through a voice recognition hub, such as Amazon’s Alexa. Automatic shading features installed around the house windows tracked the sun through light sensors to provide abundant natural light but also minimize heat and glare during the summer. Water-efficient appliances and plumbing consumed just 48 gallons per day compared to an average of 72 gallons per day for an typical U.S. household. 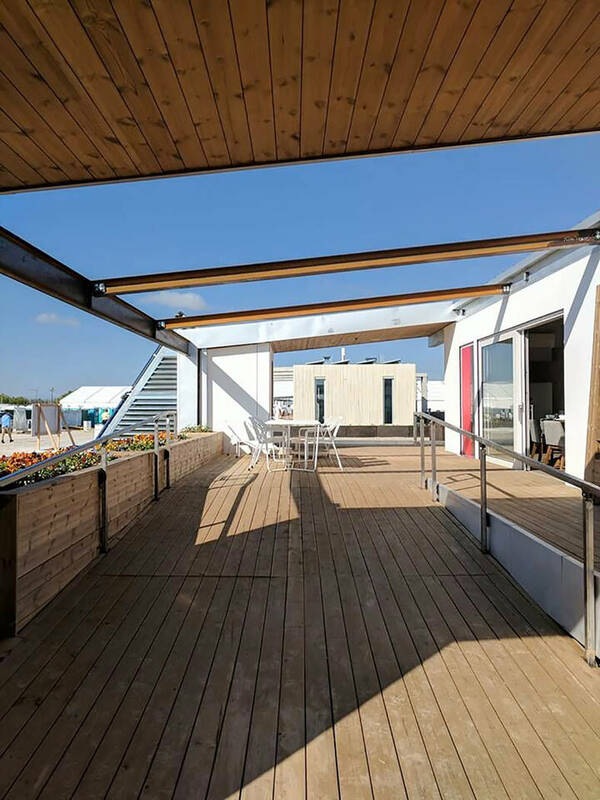 During the Solar Decathlon competition, the home was also able to filter and recycle gray water to irrigate the drought-resistant plants and vegetation that made up the outside landscape. 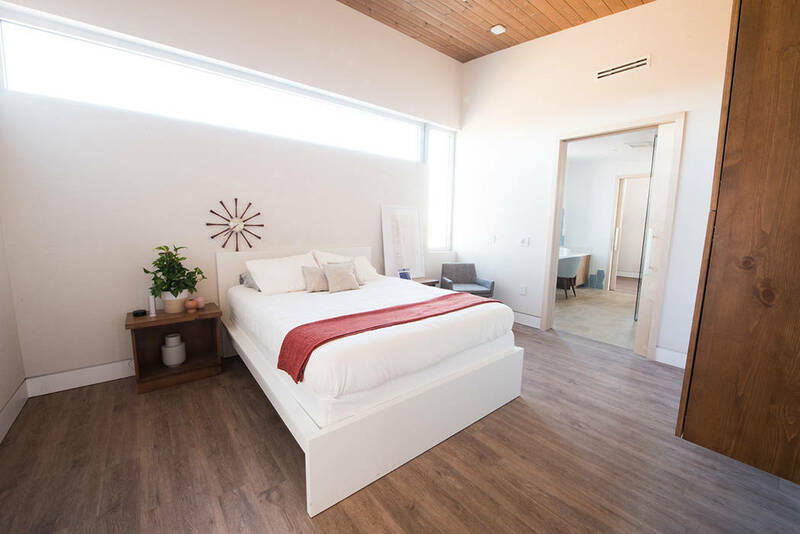 The third goal of the Sinatra Living project was to create a responsive health care environment, by equipping the structure with smart home devices that can facilitate communication between occupants, external family caregivers and health care professionals. The compact, interior design of the home included a bedroom, bathroom, utility workspace, living room, kitchen and dining room area arranged in a circular floor plan. A solar-thermal radiant heating system contained hydronic tubes that were mounted under the floor space to maximize heat transfer from the sun shining on a mechanical unit positioned on the south-facing exterior of the home. The solar-thermal water tanks also provided hot water on demand. A sloping, horizontal rooftop overhung the south-facing wall, as well as the building’s east and west sides, to provide shade to the outdoor living spaces. Sliding glass doors allowed the interior kitchen and dining room to be extended outside to the front porch and side patio area. The original design of Sinatra Living included solar panels mounted on the rooftop to provide 6.8 kilowatts of photovoltaic solar power to the home throughout the day when the sun is shining and a 13.5 kilowatt-hour Tesla Powerwall 2 was to provide battery storage for supplemental electric power at night. The habitat could operate off-grid, if needed, while continuing to provide power to life-sustaining medical equipment, temperature control devices and lighting, even during a utility grid power outage. For transportation, an electric car like the Tesla Model S could be recharged by using electricity supplied from the photovoltaic solar panels and Tesla Powerwall 2 storage battery. Innovations that set the Sinatra Living home apart from other competitors included a phase-change material in the ceiling areas, developed by Neal Energy Management, that helped passively mitigate temperature changes throughout the rooms. Sodium-chloride compounds in the phase-change material are normally solid but have a melting point of 80 degrees Fahrenheit. With summertime temperatures reaching as high as 105 degrees, outside air is ducted into the home through the phase-change material, the salt compound starts to melt and absorb the heat from the outside air as it passes through. On the other side of the phase-change material, the same air that has shed its heat is now cooler by 25 degrees, down to 80 degrees Fahrenheit as it passes into the home and mixes with the internal air flow. At night, the air flow direction through the ducts and phase-change material can be reversed, so that internal fans can cool the liquefied salts below 80 degrees Fahrenheit. The chemical compound could revert back to solid form when residual heat is blown out through the ducts to the outside air. Three redundant mini-split heat pumps, each with a SEER-33 rating, were supplemented by ceiling fans to provide air circulation and extra cooling during the summer. However, these systems don’t have to work as hard as a traditional HVAC system because most of the cooling of the air temperature is initially done through the ducted phase-change material. HEPA carbon air filters helped clean and re-circulate the inside air to maintain good quality of health throughout the home for its aging residents. Martin-Harris Construction has been an adviser to the project team, along with the Nevada Commission on Construction Education and the Southern Nevada Chapter of the International Code Council, which also provided funding for the project. Other major sponsors included Switch and the NV Energy Foundation. 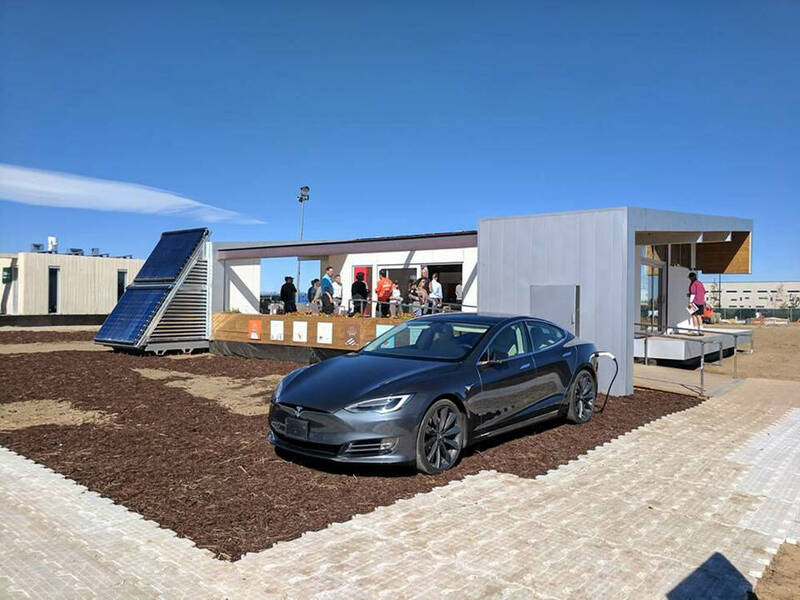 After the Sinatra Living structure was built on a lot within the UNLV Paradise campus, the fabricated home was then dismantled into sub-modules during September, shipped to Denver, and re-assembled at the site of Solar Decathlon 2017, where it was staged from Oct. 5-15. At the end of the Denver exhibition, the Sinatra Living home returned home to Southern Nevada, to reside as a showcase for innovative technologies and aging-in-place building solutions. For more information about the Solar Decathlon 2017 competition and the Sinatra Living home results, visit the UNLV Team Las Vegas website at http://unlvsd.com/.